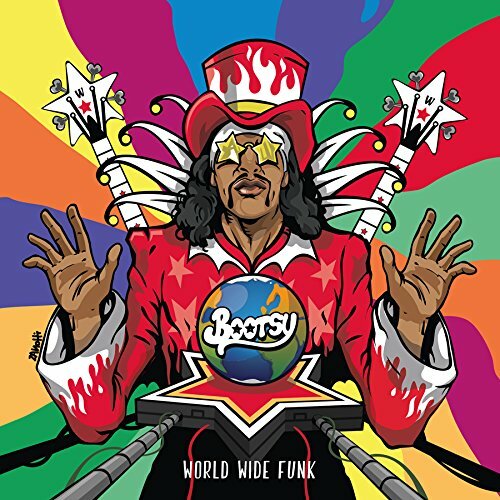 Last October the world was blessed with the latest project by legendary funk bassist, vocalist, and composer Bootsy Collins. World Wide Funk contains all of the elements Collins is most known for as an artist: funky grooves, excellent playing, and a whimsical sense of humor (evidenced by the assertion on the introductory track that Bootsy was born “a long, long time ago…deep below the Ohio river—before anyone ever heard of Ohio”). It is difficult to overstate the impact that Collins has had on generations of musicians through his work as a bassist with James Brown and Parliament-Funkadelic, as well as on his own prolific solo recordings. The sheer variety and skill of his collaborators on World Wide Funk hints at the otherwise inestimable breadth of his influence. Nearly every track on the record features a guest artist, from the shredding styles of the KFC chicken container-donning guitarist Buckethead (“Worldwide Funk” and “Illusions”) to golden-era hip hoppers Doug E. Fresh and Big Daddy Kane (“Worldwide Funk” and “Hot Saucer,” respectively) to young gun bassist Alissia Benveniste (“Bass-Rigged System” and “Thera-P”). There are also features by musicians who may be considered “usual suspects” on a collaboration-based album by a musician of Collins’s stature, such as bassists Victor Wooten and Stanley Clarke (“Bass-Rigged-System”) and guitarist Eric Gales and drummer Dennis Chambers (“Come Back Bootsy”). As one would expect from the Star Child, the M.O. of World Wide Funk is “One Nation Under a Groove”—grooves are now, as they have always been, the meat and potatoes of Collins’s style. Whether offering virtuoso musicians opportunities to stretch out as on “Come Back Bootsy” and “Bass-Rigged System,” or providing a steady groove to rap or party over as on “Pusherman” and “Ladies Nite,” rhythm is the name of the game. Even the more sentimental songs like the ‘90s R&B-Tinged “Heaven Yes” and the Jimi Hendrix-inspired, synth-based “Salute to Bernie”—a tribute to Collins’s late bandmate Bernie Worrell (who is featured on the track)—groove hard. While guest artists occasionally veer into social themes (as on “Pusherman” and “Illusions”), they do so over immensely danceable tracks without the navel-gazing and preaching to the choir that is often the currency of social commentary in pop music. Overall, however, World Wide Funk imagines a reality in which every listener is part of one big party at which some of the sharpest musicians of the day (and in some instances, of all time) are having a jam session. Generations of bassists have tried to emulate Bootsy Collins’s style, chops, and taste, and this album is essential listening for musicians who want to learn how to really groove. It’s also great party music. It is no accident that Collins’s bass lines are the most sampled in all of hip hop and dance music, and this album certainly provides a new batch of infectious riffs to bump. Bootsy has been the funkiest bassist around since the ‘60s and he still is. Creating lines that range from funky slapping to deep-in-the-pocket grooves, it is doubtless that Bootsy will continue to find new listeners who have an appreciation for rhythm and low end. 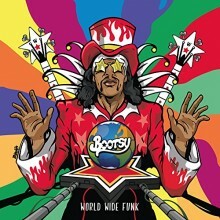 Bootsy Collins’s classic albums still sound fresh today, and World Wide Funk is destined to join them in the future. This entry was posted in Rhythm & Blues, Soul, Funk and tagged 2018, 2018 music, 2018 music review, Bootsy Collins, CD review, funk, Mascot Records, Matthew alley, Soul, World Wide Funk by aaamc. Bookmark the permalink.